Key West Florida Fishing is a true labor of love. I began fishing with my father at the age of 5 in New Jersey where he taught me to fish on his charter boat. We fished numerous tournaments together in many incredible locations and soon my father I and shared a love of fishing. I caught my first sailfish on the Gone Fishin out of Islamorada, FL when I was 7 and was hooked for life. I told my father that someday I would live in the Florida Keys and fish for a living. Twenty-eight years ago I made that dream come true. 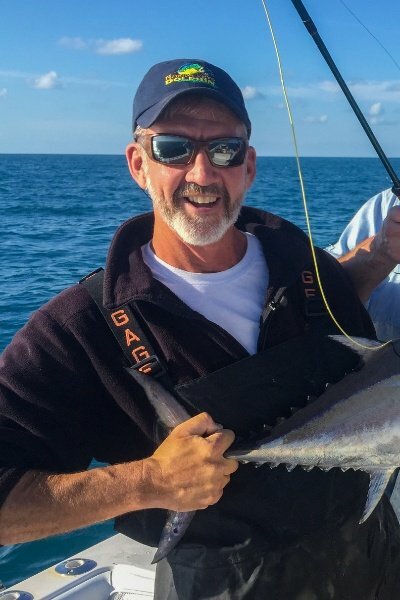 I moved to Key West and began chartering my first light tackle fishing boat. Two years later I bought a custom built 52-footer from Buddy Cannady and named it Jack Tar 2. Here I was following in father's footsteps; it was absolutely amazing! I was living the dream, fishing from Venezuela to Cuba, the Bahamas to Maryland, the Outer Banks, and all over Mexico. After nine years of running my own offshore fishing boat I found I enjoyed a more personal relationship with customers. Sitting on the bridge and watching the mate, I couldn't wait to get in the cockpit and help out. So I sold the Jack Tar 2 and bought another light tackle boat. The endless fishing opportunities and speed to get to where I wanted to go made light tackle fishing perfect for me. I started fishing more with live bait and doing more sight fishing. I developed a unique style of fishing with my clients that created a more hands on, enjoyable experience. This new style allows me to teach others the sport I enjoy so much. I found the more I teach, the more clients are able to do on their own which keeps them involved and having lots of fun. Clients hook their own fish, cast their own baits and learn to tie knots on their own. Sure we lose a few fish sometimes and it takes a lot of patience some days, but the look on someone’s face when know they caught a fish and did it all by themselves is priceless. They just experienced the entire process from start to finish and loved it! Of course, some people still enjoy when I do most of the preparation for them and that’s great too. But the chance to cast a live bait to your first sailfish on your own is an experience that can’t be beat and shouldn’t be missed!